Can sleep tracking make us feel better? Our wearables want to tell us how well we're sleeping, but do they really work? We're not sleeping enough. It's a fact. We're also not doing it very well even when we get round to it. Caffeine habits, sleeping pills, trips to the pub and all other forms of uppers, downers and all-arounders aren't helping; and all up against the shadowy spectre of stress through overwork and an ever-connected lifestyle. We're just not able to take a break like we used to and we'll consume whatever it takes in our ill-considered attempts at keeping ahead. But now is the age of the quantified self and wearable fitness trackers are here. The latest trick in their 'live better' drive - they watch you while you sleep. The same 6-axis accelerometers that count your steps claim to be key in figuring out your kip quality too and a few go even further than that. The addition of heart-rate sensors, perspiration detection and under-mattress pads that figure out how you're breathing mean that some companies will even go so far as to suggest how much you've been dreaming, but is that just as fanciful as the night time tales of your unconscious? 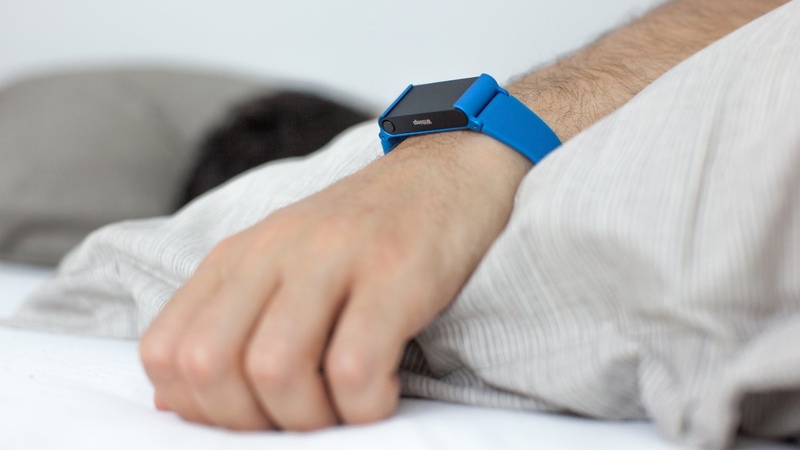 What can we realistically expect of consumer sleep trackers? Just how much better can they make us feel? One man skeptical of such sleep inferences from the current tech available is Professor Paul Gringras, specialist in children's sleep medicine and neurodisability, and lead consultant at the Evelina Clinic at Guy's and St Thomas' Hospital - one of the top sleep clinics in the UK. “The only way to tell what stages of sleep a person is in at any moment is by attaching electrodes to their heads to measure their EEG," explained the Professor. An EEG monitors brainwave activity and it's the distinct differences in the patterns that determine where you are in your sleep cycle all the way from the lighter stage one and two zones to the deeper slumber of stages three and four. “If you measure movement with an accelerometer," as all non-clinical sleep trackers do, “then you can fairly reliably tell the difference between being awake - doing your daily stuff - and being asleep. That is it." Even then, as Gringas points out, it's not always that simple. Firstly, the sensor in the device might not be that accurate and, second, the software and programming designed to interpret the data might make all sorts of mistakes. “You might be in a car asleep and go over a speed bump," he suggests. “The device would probably register that as your movement when it wasn't. Or, more likely, your partner's turning over in the night will be picked and mis-identified as you. We find that with most of these sleep trackers." If you thought you were getting a bargain with apps like Sleep Cycle alarm clock that turn your mobile phone and its in-built sensors into a monitor for just $1.29, then think again. It works by lying on your mattress all night detecting any ups and downs and is just the kind of solution to get easily fooled. What's more, the main purpose of the software is to wake you at what it considers to be the right moment in your sleep cycle. The idea is that you don't end up torn from your deepest stages of rest at the last minute possible which would make for rising at your groggiest. Instead, Sleep Cycle, and other devices that provide this functionality, promise to choose the best moment within a 30-minute window. Given that we're not sleeping enough, though, surely we'd do better to treasure every bit of kip we can rather than worry about how we feel when we open our eyes? “You are right and they are wrong," confirmed the Professor. “If you get woken from a very, very deep sleep there's a bit of sleep inertia. It can take an hour to fully get going again. “We're getting up earlier than we probably should, having not quite had as much sleep as we're biologically designed to, and it's cumulative. So, if you lose half an hour a day, that's three and a half hours over a week and that's enough to set back your learning and memory significantly. For a child, that's equivalent to a year's learning. So, it can be quite significant. “So, actually, the reason device makers do it is because they can. They can measure it, so they can set the alarm that little bit earlier. But I would go with you and I would value every bit of sleep." The other danger of getting woken earlier than you need is that you're likely to be missing out on your REM sleep. REM sleep is what happens after the four stages of 'normal' or 'non-REM' sleep. It's when you dream, and it's a largely held theory that it's this time that your brain uses to sort out and organise its work and memories of the day - a defragmentation of your biological hard drive. None of this is entirely cut and dry though, with either the purpose or what exactly is going on at the physiological level. Some have suggested that it's a neurochemical process where toxins built up from daily use of brain cells are removed and thus your head is readied for the come wake cycle. What is obvious, however, are the effects of depriving people and animals of REM sleep. Neuroscience is littered with experiments showing increase in erratic, suspicious, irritable and paranoid behaviour for those tortured enough to go without dreaming for too long. We have more dream sleep in the last third of the night. It's mostly pushed to the end. So, an alarm that's looking to wake you earlier than you need is going to be cutting your REM sleep short. That's not a particularly good idea for your mental health, and you might want to steer clear of those sleep trackers. As well as featuring one of these so-called smart alarms, Sense, the smash hit sleep tracker on Kickstarter, also takes a look at environmental conditions in your bedroom. It measures ambient noise, temperature, light and particles in the air so that it can report back on what might have woken you and what changes you can make. Again, though, Gringras is dubious as to how much benefit that really offers. “The temperature kind of matters. There are ideal temperatures where you'll probably sleep better. Whether pollen count or humidity matters, well, I'm not sure what you can do about that even if it does. Move to another country? “Light is not overrated, though. That's something we're very interested in. I've recently done some work comparing an iPad with a Kindle and a phone - looking at identical text from the Kindle Store on all of them - measuring not just the light level but the colour of light, and blue/green is the very worst. That switches off all our sleep mechanisms." Stage 1: Drowsy state between being awake and nodding off. Stage 2: Deeper sleep where your body temperature cools a little and you become disengaged from your surroundings. Part of good 'sleep hygiene' is to cut out any screen time at least an hour before bed. Even as little as two minutes checking Facebook on your phone before you turn out the light can be enough to halt the body's production of melatonin - a key hormone in the onset of sleep. If you really must be up late at the computer, then there's some free software called Flux that cuts out the blue/green end of the spectrum of backlit screens. It's not all broken promises for the current crop of sleep tracker, though. There is, or unfortunately, was one device with which Professor Gringras and his team were quite impressed - Zeo. Zeo used a headband as a clever and effective way of measuring the wearer's EEG while they slept. Without needing any gel at the points of contact, like the electrodes of a sleep lab, the device was able to feedback information on exactly which stages of sleep you've been through and at what times. It was even able to have a decent crack at recording REM sleep too, although according to Gringras this was slightly less successful. Unfortunately, the company behind it went under in May 2013 though business issues but the product itself was sound. Do we actually need to know? Fortunately, there's no need to rush out and try to buy any remaining Zeo stock.. As it turns out, it's most likely that you won't actually need to know that kind of detail to find out if you're sleeping well enough. “If I put a wristwatch on you and it says you were asleep 95% of the night, then I can say that's good sleep efficiency and you slept fairly well, and I don't need to put electrodes on your head," assures Gringras. “If you have five periods where you woke up for half an hour, then I know your sleep quality wasn't good. Your sleep efficiency is down. From that perspective, although it's not measuring the brain waves and sleep architecture, if sleep is very fragmented, then most make a reasonable job of differentiating between sleep and wake. In that case, these sleep wearables are still useful." Indeed the Evalina clinic, and other sleep centres, issue similar, pro-grade, wrist-worn trackers to keep a count of how much shut eye their patients are getting while back in their homes. All the same, that doesn't make it a good idea for everyone with a sleep problem to have access to this kind of quantified self data as and when they need. “If someone's developing insomnia, the very last thing they want is to be hypervigilant, counting every good or bad minute, because that will make you worse." But despite Gringras's warning, he certainly considers consumer sleep trackers a good idea, even if his motives aren't quite pointed where you might think. “These wearable devices are fascinating. It's incredible in what they can do. And I'm hoping the spin off is that these sleep specialist manufactures cannot keep charging us at the clinic 900 quid for a watch. There's nothing like having widespread consumer interest to bring down the price." So, on a basic level, sleep trackers are certainly not a bad idea. They give us an indication of how much sleep we're getting and how often we're waking up in the night, and that's enough to offer a decent reading of whether we're resting well. More recently, devices like Beddit are employing ballistocardiography (BCG) to marry up signals of respiration, heart-rate and movement in attempts to offer more lab-like information that the EEG-based polysomnography can. Such accuracy, though, might be something of a misdirection for sleep tracking at home. The real key to their success, their true usefulness, is going to be linking them with interventions that help us sleep in a healthy. At the moment, all sleep trackers can do is count it. Get us resting well and feeling better and they'll cement their place in the home of the future.